While the average worker in the U.S. saw their wages rise 2.5% over the past year, workers in these five cities saw a much bigger bump, according to PayScale. 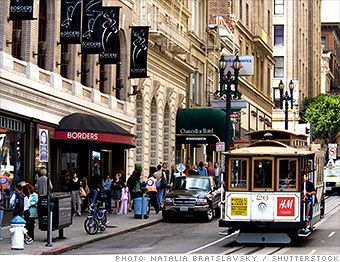 Tech companies have been on a hiring spree in San Francisco and other Bay Area towns. Between established tech titans, like Google (GOOG), HP (HPQ) and Apple, (AAPL) and a constant stream of start-ups, the San Francisco area produced thousands of jobs over the past year, according to Katie Bardaro, the lead economist for PayScale, a website that tracks pay data. For the year ended in May, the area's unemployment rate has fallen two percentage points to 6%, well below the national rate of 7.6%. Workers here also tend to earn more. In June, wages rose by 4.3% year over year -- significantly higher than the national average, according to PayScale. One reason employers in the Bay Area offer such substantial salaries is to help workers afford to live there. The cost of living is among the highest in the nation, about 70% higher than a city like Indianapolis, according to PayScale. The PayScale Index tracks changes in what full-time employees earn over time based on quarterly compensation trends. This report is based on the year-over-year percentage change in compensation for the 12 months ending June 30, 2013.